"Walks readers through Ephraim's experience... Ephraim is real to the reader." --America's Civil War. Full text. "One will not find stirring accounts of battle, but entries that describe day-to-day life of a young man who continued to serve his country despite being hobbled by illness and a battle injury...” --Western Pennsylvania History magazine, Senator John Heinz History Center, an associate of the Smithsonian Institution. Full text. "...hardly a page where there are not one or more illustrations, such as photographs, period woodcuts or reproductions of Ephraim Miner's diaries." --Civil War News. Full text. A new book chronicles the wartime diaries and mis-adventures of Ephraim Miner, a Western Pennsylvania farmer boy whose eardrums were shattered and his feet frostbitten at the Battle of Fredericksburg. He spent more than 2 1/2 years languishing in the Army's ill-prepared health care and convalescent system, bouncing from Washington to Baltimore, New York, Indiana and Ohio. In the process, he crosses paths with Civil War nurse Walt Whitman (who was in the habit of giving cheap blank diaries to soldiers), President Lincoln (at the only battle he ever watched in person), General George McClellan and General George Meade (who meted out punishment to Ephraim's regiment for insubordination). Researched, written and edited by the soldier's great-great grand nephew, Minerd.com founder Mark Miner, and designed by award-winning Semonik Creative, the book is available in three attractive formats. You will want a copy for your personal library and to give as legacy gifts, holiday and birthday presents and stocking-stuffers to relatives and friends. Order your copy on this website, or through Amazon.com. Born and raised in Somerset County, PA, Ephraim and his fellow soldiers in the 142nd Pennsylvania came under some of the deadliest enemy gunfire of the war. At Fredericksburg, with 12,600 Union casualties, the 142nd Pennsylvania was one of a handful of Union regiments under Gen. George Meade to break through enemy lines commanded by Stonewall Jackson and A.P. Hill, only to be savagely repulsed. 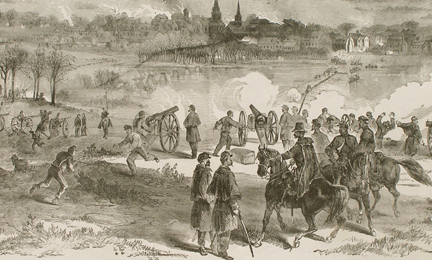 Union bombardment of Fredericksburg, two weeks before Christmas 1862, where Ephraim's eardrums were deafened by cannonfire. In the aftermath of battle, Ephraim may well have seen, spoken with or been treated by Clara Barton (future founder of the Red Cross), Louisa May Alcott (author of Little Women) and Walt Whitman (author of Leaves of Grass), who were nurses treating the Union wounded at Fredericksburg. Later, while in hospitals in Washington, D.C., Ephraim's path may again have crossed with Whitman, who spent much of the rest of the war as an aide in the Union hospitals in the city. They could have seen each other again as both are known to have spent time writing on the steps of the U.S. Capitol. It is entirely possible that Ephraim's diary was a gift from Whitman, who is known to have given wounded soldiers cheap writing materials in the same places and at the same times Ephraim was there. No longer fit for active duty, Ephraim was sent to army hospitals in Belle Plain near Fredericksburg, and thence to Washington, D.C., Philadelphia, Fortress Monroe, City Point, VA and back to Alexandria, VA. 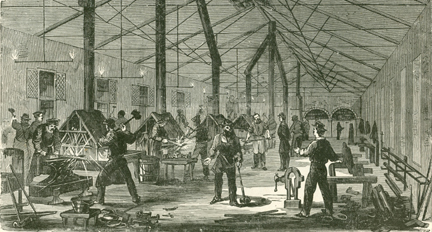 In 1864, he was transferred to the 22nd Veterans Reserve Corps, and sent to a wide variety of military facilities to provide guard duty and hospital orderly services -- in the former Confederate capital city of Richmond; the Albany Arsenal at Watervliet, N.Y.; the Camp Morton POW facility near Indianapolis, Ind. ; Camp Tod in Columbus, Ohio; and finally at Camp Dennison near Cincinnati. He writes about the Battle of Fort Stevens, near where Walter Reed Army Hospital is today; his joy at receiving letters from home and occasional visits from relatives; his reaction to the assassination of President Lincoln; and much, much more. In the process, Ephraim's soul was seared with the suffering of many new friends he'd met, from New Hampshire, Maine, New York, Ohio, Michigan and Indiana. The back pages of his diary contain their signatures and hometowns, as well as lists of family and friends who sent him letters. 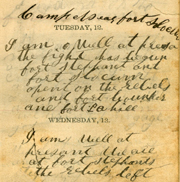 The book not only includes a transcript of all of Ephraim's 1864 and 1865 diary entries exactly as he wrote them, but also cross-references where the 142nd Pennsylvania was in action, what else was happening during the war, and deaths, wounds and captures faced by scores of his extended Minerd-Minard-Miner-Minor cousins. In short, it is a comprehensive look at a part of the Civil War experience not often told -- the lengthy medical recovery of a soldier who found other ways to serve his country, and in the process discovered the people, highways and byways of the country he was serving.